Want to Transform Your CMS Into a Content Marketing & Sales Machine? 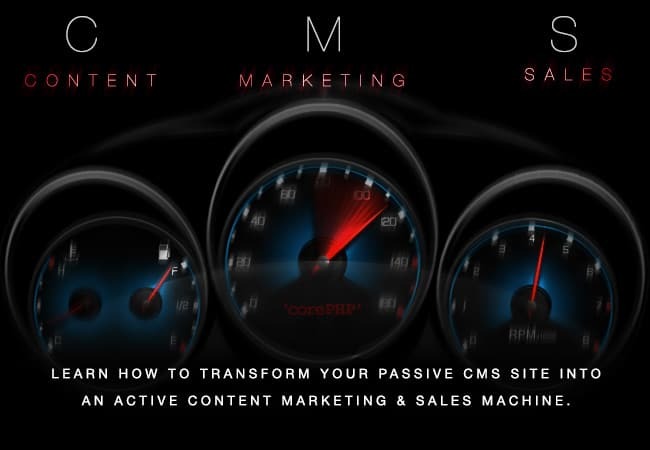 Find out how to transform your passive CMS into an active Content Marketing and Sales Machine April 8th! Mark your calendar, because ‘corePHP’ is kicking off our 2015 LIVE tour! This is a VERY BIG YEAR for CMS users around the world, as converging technologies and entirely uncharted buying patterns continue to radically change the business landscape. This year, it’s more important than ever to keep your eyes on the road, and hands on the wheel to stay up on trends, as they will directly business, non-profits, education and government agencies. This session is for business owners, marketers, e-tailers, integrators and website builders. You can’t get ahead of the coming curve (it’s already here), but you can learn new ways to ride this technology convergence, and at minimum, avoid being the victim of a hit-and-run “tech drive-by.” Come decide for yourself whether now is the right time for you to transform your passive CMS into an active Content Marketing and Sales Machine. Get the facts, track the technology, and get practical “how-to” advice from people who know. For over a decade, Content (C), Marketing (M) and Sales (S) technologies have all been slowly converging and merging, like three massive traffic patterns into one lane of fast-moving traffic. Thanks to the advent of cloud, mobile, frameworks, APIs and more, this real-time CMS convergence is happening right here, right now, before our eyes. Just as CMSs like Joomla, Drupal and WordPress extended their E-commerce capabilities to include advanced marketing and sales technologies, so too have E-commerce and Automated Marketing solutions extended their own featuresets to include Content Management (for example Magento, SalesForce, HubSpot and more). Meanwhile, mobile app technology continues to erode the mindshare of once loyal site customers worldwide. Does this spell impending doom to your favorite CMS? What will the landscape look like when it’s through? Who will win and who will lose in the fast-coming convergence? We’ll tackle these questions and more during this live event, presented at the Joomla! Chicago North User Group meeting on April 8th. This is no “sales pitch.” It’s an information-packed learning session you’ve come to know and expect from Joomla user group meetings, and also from sessions at CMS Expo. We’ll be focused on delivering practical, relevant advice to help you get the very most out of your Joomla CMS, making use of essential, readily available marketing and sales technology and latest best practices. This session will be presented by Steven Pignataro, CEO of ‘corePHP’ and a co-founding member of the Joomla Community. Co-presenting will be John Coonen, ‘corePHP’ CMO, Founder and host of the CMS Expo Learning and Business Conference, and past President of the CMS Association. This entry was posted in Technology Events and tagged CMS Technology, Content Management, Content Marketing and Sales, Convergence, e-commerce, Marketing Automation on March 11, 2015 by John Coonen. Hmmm, I might have to make the drive down to see you guys!